A talk about this year's astrological transits of the British royal family, concentrating on the hierarchy of the family over the next twelve months. The talk will discuss the transits of Queen Elizabeth and Prince Philip, Prince Charles and Camilla, Prince William and Prince Harry. Your participation is welcome. Continuing the Harmonic story but designed as a stand alone class. Astrology is normally learned through the intellect, whether it’s on-line, through books or classes or in conversations. Rarely do we have a chance to drop into a feeling sense of the zodiac signs, experience the planets directly in the body, and engage with astrology as alive in our world. 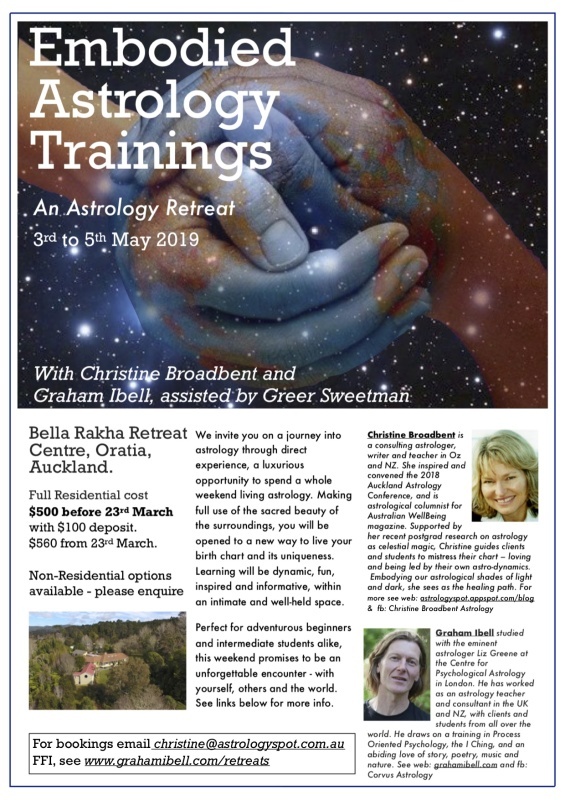 In this exciting retreat, experienced astrologers Christine Broadbent and Graham Ibell, assisted by Greer Sweetman, will be midwifing a journey into a direct astrological experience; one in which you will learn or deepen your astrology via sensations, embodiment, dreams, synchronicities, conversations, subtle awareness, the imagination - in fact through all the senses! Always aiming to equip you with an accurate, nuanced and useful relationship to astrological symbol, and through excavating your own birth chart, we will help you to come away with a new relationship with astrology. and a feeling of being more alive to yourself and the world. Embodied astrology offers enrichment, a chance to engage with bodily, emotional and soul-level understandings. Experience a living astrology with rich paths of personal integration. Use Astro-drama techniques to explore and extend our relationship with planetary aspects. Deepen our relationship with the all-important angles of the birth chart, our cross of matter. Explore new ways to understand illness and to learn from body symptoms. Encounter astrology in nature through a shaman walk and elemental exercises. Access intangible dimensions of planet archetypes through music and movement. Discover, through our life stories, the significance of the houses as fundamental to our planetary potential. Entice our own natal Moon to reveal itself as container and em-body-er of our mysteries. Seek to harness the potent energy of the Dark Moon to access a creative renewal that we can name and claim with the impetus of Sunday’s Taurus New Moon. Work with dreams, star watching, journaling, elemental and modal studies, and more. Our learning sessions will be juicy, stimulating and provoking, including pair work, group interaction, and solo work. Alongside the rich astrological tradition, teaching will draw on myth, poetry, psychology, alchemy and nature, and include plenty of chart examples. All this in the deeply satisfying embrace of Bella Rakha’s expansive natural beauty.